In 2018, UBC published a new Strategic Plan that articulated the intention to expand the creation and dissemination of open educational resources as well as recognized the contributions that UBC faculty, student and staff have made in this area. These contributions have had a significant impact: in academic year 2018, an estimated 15,388 students were impacted by courses using open resources in place of paid textbooks or readings. This replacement of traditional textbooks with open resources has potentially saved UBC students an estimated $1.5 to $2.3 million dollars this academic year. 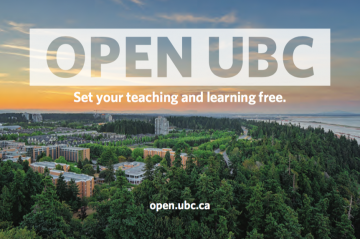 The wide diversity of UBC open education initiatives and efforts, from strong AMS advocacy and innovative instructor efforts to increased strategic support and funding, is helping to ensure that the adoption and use of open resources continues to be a significant practice at UBC. It looks like the 2018 AMS Academic Experience Survey (AES) has officially been published and one interesting finding is that 86% of undergrad respondents reported that they have used open educational resources in lieu of textbooks at least once. The Ubyssey covers the expanding conversation around the affordability of learning materials, including the cost of online assessment materials, and mentions open educational resources as having a role to play in possible mitigation strategies. Meanwhile, OpenCon 2018 will be in Toronto this year — OpenCon is an international open ed, open data, open access event for students and “early career” professionals. Interested folks have to apply to be able to attend as they attempt to “bring together a diverse, representative, and engaged group of participants, with travel scholarships available to most participants”. This post was adapted from the TLEF and Open Education Poster presented at the TLEF Showcase. The original poster can be downloaded here. Thanks to the amazing faculty and students, there’s a lot of open educational activities happening at UBC. In an attempt to quantify and explore some of the trends, I, along with some of my colleagues, have tried to dig into some of the nitty gritty details in a new resource published at open.ubc.ca that I’m calling Open UBC Snapshots. This first Snapshot attempts to look at how open resources are replacing traditional textbooks and what we found is that the number of UBC students impacted by open resources has doubled in 2016 compared to 2015. A large driver of this trend is the great faculty in the Math Department, who have replaced textbooks with open resources in all first year and most second year courses. In trying to quantify OER adoptions, it quickly became apparent that much of it is happening below the radar and we’ve tried our best to surface and verify OER adoptions. Largely, there is no real radar for how and which educational resources are used and I suspect that we’ll have missed some very important open practices. If you know of any open resource adoptions at UBC that do not seem to be reflected in the Snapshot, please let me know so we can be as accurate as possible. In the next Snapshot, we’ll move away from resources and examine some of the open practices have long been adopted or are emerging.